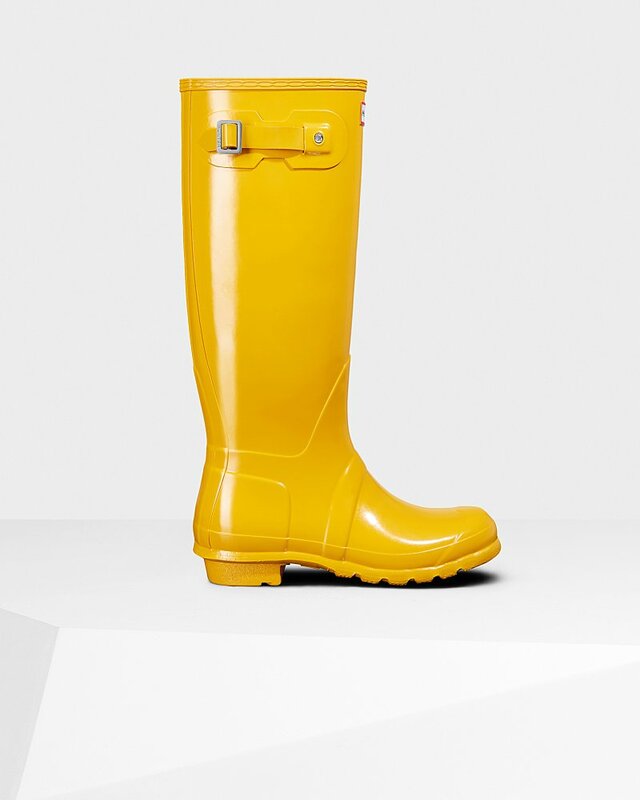 Women's Original Tall Gloss Rain Boots is rated 4.3 out of 5 by 47. Parfaites pour les conditions humides, ces bottes Wellington pour femme sont au cœur de la marque Hunter Original depuis leur lancement en 1956. Fabriquées artisanalement en caoutchouc naturel à partir de 28 pièces, ces bottes nécessitent trois jours d'assemblage sur une forme en aluminium, conçue sur mesure pour Hunter, avant d'être vulcanisées pour encore plus de protection. Dotées du motif rainuré Hunter Original et d'une confortable doublure en polyester, les bottes hautes Original fini brillant des classiques incontournables pour les conditions humides. Nous recommandons de porter les bottes Hunter avec des chaussettes pour éviter le contact de la peau avec le caoutchouc. Les chaussettes des bottes Hunter sont spécialement conçues pour être utilisées avec la gamme de bottes Hunter et sont dotées d'un rabat pour couvrir le bord en caoutchouc et en nylon de la botte, évitant ainsi tout frottement. Rated 4 out of 5 by Rebeka from LOVE! I bought these boots as a birthday present to myself and absolutely LOVE them. I was worried that since i am a plus size that the tall size wouldn't fit my calves but they're perfect. I have since also added a pair of socks. Rated 4 out of 5 by hmhaight from super cute love them, adorable the only thing is having larger legs they fit a little snug but hopefully over time they'll loosen up a bit (making them a 5). 100% water proof and super durable. I love them! Rated 1 out of 5 by Disappointed customer from Poor quality The finished cracked within 2 months of owning these boots, nothing the company will do for you. Horrible customer service, not worth the money! Sizing is inconsistent, tried on 3 of the same boots. One was to small, another about 2 sizes to big and the last fit appropriately, although not the correct size. Rated 4 out of 5 by Samm from Love them but tight I bought these s few weeks ago and i love them but when i went to wesr them they are tight around the calf with jeans on. This is dissap ointing but I threw box away. Rated 4 out of 5 by Lisa from Great boot Great boot. I love them. Wear them winter spring and fall. Had a pair and they got a hole in the foot area and hunter replaced them with little to no problem. Only negative comment is that the buckles were not done up and they r the most difficult buckles to get right. Rated 5 out of 5 by Jilly from Fast delivery Love the boots Bought hot pink tall glossy, adore them! Fit true to size, look even better in person than on the site. Pictures don't do them justice! Thanks! Rated 1 out of 5 by Tracy from Paying for name not quality Both boots started cracking and leaking after 1 year of light wear. Super disappointed. Efforts to replace all failed. Will not purchase again.